First off, a little bonus doodle. Apologies to everyone. Truly. Everyone. Next, I finally confirmed a table at Convergence in Bloomington, MN (Twin Cities Area) for June 30-July 3rd. I’m totally psyched, I love the twin cities. I look forward to seeing you all there! Next, regular commenter Frank posted a really sweet tale of his reading my-and-other’s work (thanks, Frank! ), and Lauren mentions “reading my work” over at comicbookresources.com. Also, thanks for the link from Interverse! Outside our atmosphere: I got to see the big moon Friday (Seattle’s usual overcast weather was kind), and our satellite “Messenger” made it to Mercury. Don’t melt, little guy! And lastly, here’s (below) a little fan piece from technophile posted in Random Secrets. Wait a second, so did Yuri and Dimitri get together that one time early on? The next question naturally being, did Dimitri actually clean off his skin with steel wool and alcohol? Brilliant bonus doodle. No apology necessary. I’m with Matt. I LOL’d. Oh right, the strip where Yuri and Dimitri hook up, if you’re curious. 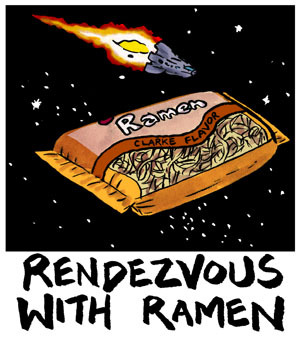 Avoid that ramen. It’s got spiders in it. Now I know how a cybernetic person m********e! TOO MUCH INFORMATION! Will Yuri ever decide to become human again? Also, how does she eat? Does she recycle her….you know what as food? So, I’m guessing Yuri hugely augmented her brain as well? I mean how could she experience all of Earth’s movies and books in such a short time? An ordinary human brain simply couldn’t process all that information that quickly. It seems pretty clear that all this augmentation is moving her further and further away from mere human concerns. Sorta reminds me of Dr. Manhattan in Watchmen or Morbius from Forbidden Planet. Here’s hoping she stays interested in the Eeb’s plight long enough to help the others! In playing with Gerf’s idea (Hey, sometimes it takes the naivety of a childlike mind to find the perfect solution to a problem. ), it’s also pretty clear that even thick skinned Dimitri isn’t the one who is immune to derision–sexual and romantic prowess is his one sore point. Maybe Gurf himself? The only derision Gurf seems to care about is from his own mother! 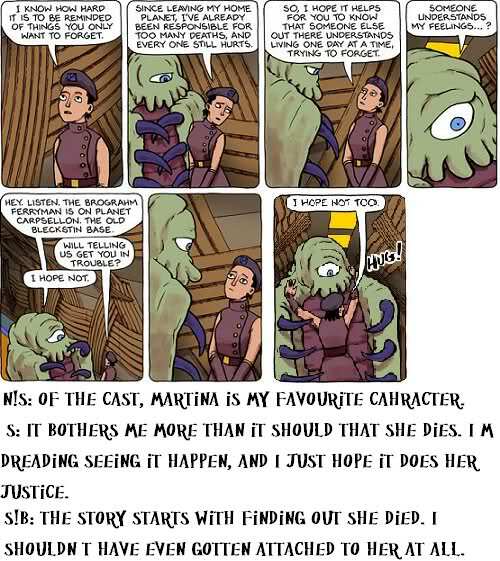 I’m gonna be bummed when Martina dies too. I mean I know it’s coming but that doesn’t mean I’m gonna like it. Huh… I thought TALKING about the steel wool & alcohol is as far as they got. It’s time for Dimitri to give up this line of inquiry and go zap himself with a stunner a few more times. wow Yuri looks bigger…she’s sporting the Mrs. Megatron body. Pretty soon she’ll just be her own ship. I could definitely see Yuri becoming a villain the way she’s going now. He is one lab accident away from becoming a super villain. @Corpore Metal: If she can jack into a computer, she can mentally do anything a regular computer can. Seeing “Earth’s entire catalog of movies” for a computer would be the equivalent of moving the files from one disk to another. Consider that the bar-bot called a trillion Gigabytes “hardly any space at all”. Any computer capable of storing that much would likely be able to move the trillion Gigabytes very quickly. So quickly that from a human’s point of view, it appears instantaneous. @Frank: Yes, you could, but you wouldn’t have as much fun banging your head against the desk because THE STUPID F***ING CHARACTERS ARE JUST SITTING THERE NOT DOING WHAT I’M TELLING THEM TO DO WHY CAN’T I GET THIS DRAWING RIGHT I WANT MY MOMMY and all the other stuff that makes life with us creative types such an adventure for the people around us. I think it’s more fundamental than merely “jacking” into a computer. I think she’s started adding artificial neurons and whole additional artificial sub-organs to her organic brain. Organic brains and neurons just can’t process or experience that much data that quickly. My guess is that it’s gotten so that she’s now experiencing a several thousand fold or even a million fold increase in her experience of subjective time. For every second that passes for us, she might experience the equivalent of a fortnight of subjective time. It’s sort like how Trinity in the first Matrix film suddenly learns how to fly a helicopter in second. I don’t think it was her organic brain that did that, it works too slowly to commit all those motor memories. I think Trinity “off loaded” that task onto artificial extensions of her brain wired into that “jacking in” chair she sits in. At least that’s how I rationalize it. That way, she just doesn’t see the blur of zillion dense pages of text roaring by on a computer screen. If that was the case, she just sees meaningless noise–she’s not actually learning anything. No, the way I see it, she actually reads, experiences and memorizes all those those zillions of pages text or actually subjectively sits through watching all those movies even though it only takes a few seconds for us. Dimitri: Penny for your thoughts. Yuri (After experiencing nearly a month’s worth of subjective time in the moment Dimitri just said that. ): Oh, just thinking about stuff and working on a few projects. How’s your vodka? See? It kind of automatically drives her to be a bit remote and maybe a bit arrogant sounding because she really can’t quickly sum up all that she may have done from second to second. It’s like trying to have the patience to talk with trees, starfish, glaciers or something. But here’s the really horrifying thing, let’s apply this to Potty Bot. Assuming that Potty Bot is actually sapient–and by all that’s even remotely good and decent in this universe, let’s hope not!–we have to assume that it’s artificial brain is actually intentionally limited and small so it only experiences time at roughly our speed. Otherwise it might be staggeringly bored merely being, well, a portable talking toilet. enough talk about neurons, I want to know more about what it was that need wiping off with steel wool and alcohol! yaaay! Twin Cities! I’m glad. Dimitri is mostly ‘wiped’ on alcohol anyway. Yuri is in the Kurzwielian zone he calls “The Singularity” and reminds me of what some are advocating in the “Trans-human Movement.” She is self contained from most human action and feeling yet jacked into an electronic and photonic network that boggles the mind. She is lost to us.